Students using 30-year-old textbooks, teachers buying basic supplies, schools permanently on edge of closing—this is the all too common face of public education in British Columbia in 2018. This is despite the past school year seeing the first meaningful injection of funds into BC schools in over a decade. The new money is paying for over 3,000 teachers, which is a welcome improvement, but which is only making up for the BC Liberals’ 2002 decision to unilaterally break the government’s contract with teachers—a move that allowed the Province to increase class sizes and offer fewer supports for students with special needs. Unfortunately, this recent funding injection does not resolve the remaining, systemic underfunding of education that is still with us. How did we get here? A key driver of public school underfunding has been BC’s funding formula, which dictates how (and how much) money is distributed from provincial government coffers to school districts, and ultimately to schools. The problem with the current formula, which originated in 2002, is that it hardwires austerity into our education system. In the run-up to last spring’s election, the BC NDP promised to conduct a “comprehensive review” of how BC funds classrooms. One year later, an independent panel is indeed quietly reviewing the funding formula and is set to make recommendations this summer. The review is an opportunity to put public education on a stable footing. However, it is hobbled by the fact that discussion of the total amount of funding is explicitly off the table. This turns what is fundamentally a political issue—how much do we value the education of our children?—into an administrative exercise. You can’t work magic with a formula that distributes an insufficient total pool of resources. To understand today’s continued underfunding of education and how the current funding model allows it to persist we need to look at the big picture of total funding for schools. This piece reviews the state of K–12 funding and offers many lessons for a new and better funding model that would support quality public education for all BC children. 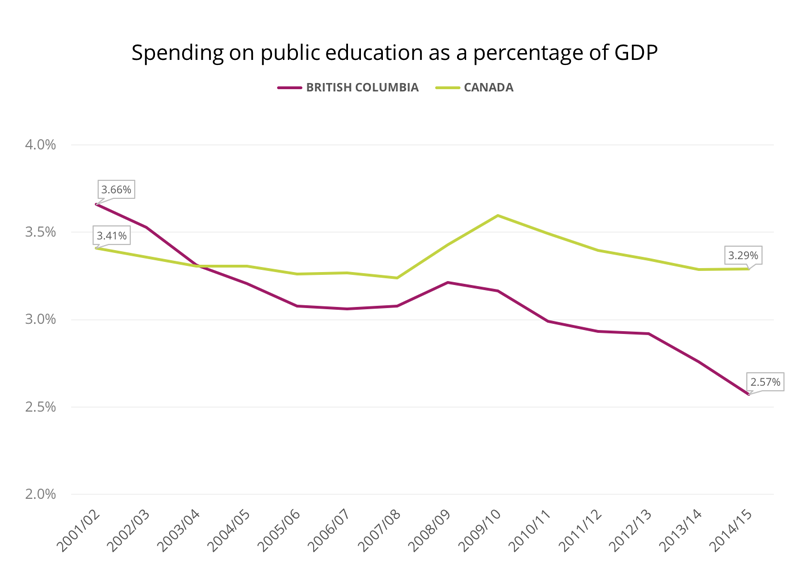 British Columbia lags far behind many other provinces in spending on public education. In 2010, the last time Statistics Canada compared per student spending in a consistent way, BC was second from bottom among the ten provinces, spending nearly $1,000 less per student than the national average. In 2014/15, the time of the most recent Canada-wide data for total education spending, our province devoted a meagre 2.57% of GDP to public K–12 education, one third less than the 3.66% we set aside in 2001/02, and nearly one percentage point below the national average. When only operating grants are considered (not counting spending on building or repairing school buildings), BC spent 1.97% of GDP in the 2017/18 school year—the same proportion as in 2015/16, before the current injection of funding—and over a full percentage point less than in the late 1990s. As one local teacher representative told me, “Students know what the adults in their society think of the importance of their education by looking at the resources they are given for their schooling.” And the picture doesn’t look good. Source: Statistics Canada, CANSIM tables 478-0014 (education spending) and 384-0038 (GDP). While defenders of the status quo are quick to attribute the decline in education funding relative to GDP to falling enrolment, the truth is that enrolment has been rising again since 2015 and is projected to grow by about three percent over the next three years. And even while enrolment did decline by about 10 percent between 2000 and 2015, only a small part of the slow growth in funding can be attributed to this decline. In fact, if BC spent the same proportion of GDP on K–12 education as it did in 2001/02, we would be spending $2 billion more on education, and funding per student would be 40 percent higher than it is currently. Only a small share of this 40 percent is due to declining enrolment; if enrolment had stayed constant over the period (so today’s hypothetical pool of money would be spread over a larger number of students than there are today), funding per student would still be 30% higher. Source: British Columbia Ministry of Education, Operating Grant Tables by year. Today’s funding formula is a big reason behind this long-term relative decline in funding. Excessive cost control is baked into the very design of the formula. So how does the formula work? The vast majority—just under 80 percent—of the money going to British Columbia’s 60 school districts is based solely on the number of students enrolled in a given district. This past school year, about $4 billion out of a total $5 billion in operating grants governed by the formula was distributed according to how many “full-time equivalent” (FTE) students were enrolled in a district at a rate of $7,301 per FTE (and $6,100 per FTE in online learning). The remaining fifth of total funding attempts to make up for the broad diversity of students and districts in our province. Some 13 percent of funding is distributed based on the number of students with “unique needs.” For example, students with special needs are additionally funded at between $9,610 and $38,140 each depending on the scale of their needs, students in Aboriginal education are funded at an additional $1,210 each, and students in English Language Learning (ELL) are funded at an additional $1,395 each. The final and smallest portion of funding accords with “unique district needs.” Here, for example, more money goes to rural districts or districts in colder climates; however, this extra funding is not always sufficient to make up for the big disparities between districts, particularly the higher per-student costs of running small rural schools and the higher rural transportation costs. While some costs to schools vary with the number of students (for example, the number of textbooks, computers or pencils a school needs), many others are less flexible. It costs roughly the same amount to heat the same school regardless of whether it is attended by 300 students or if it is attended by 270; administration and maintenance costs are also roughly the same. Modest drops in enrolment also will not change the number of teachers, including specialists, a given school needs—in particular because of limits on class sizes and class composition ratios regarding the number of students with special needs—both key to guaranteeing quality of education. Per-student funding glosses over the many relatively fixed costs in our school system, very necessary things like utilities, administration and maintenance. What’s more, per-student funding amounts are very abstract: a district does not pay for a “per-student” bundle of services, it pays for very concrete supplies, salaries, benefits, utilities and so on. It is much easier to gauge the total cost of a program or curriculum change, or of hiring a number of additional specialist teachers, or of maintaining a school, than it is to put a figure on how much any of these will cost per student. Funding distributed almost exclusively on a per-student basis obscures the true costs of a well-functioning public education system. In short, our current funding formula is not necessarily aligned with the real identified needs of our K–12 students, and the over-reliance on per-student funding makes it easier for funding to lag behind student needs. Finally, the lack of a direct link to fixed costs and concrete needs in the funding formula makes it harder for the public to assess whether the per-student amount is adequate to meet existing needs—and makes it easier for the Province to download responsibility for meeting new or escalating system-wide costs onto districts. If per-student amounts are allowed to stagnate or grow too slowly from year to year while costs and responsibilities increase, underfunding automatically ensues. And this is precisely what has happened. 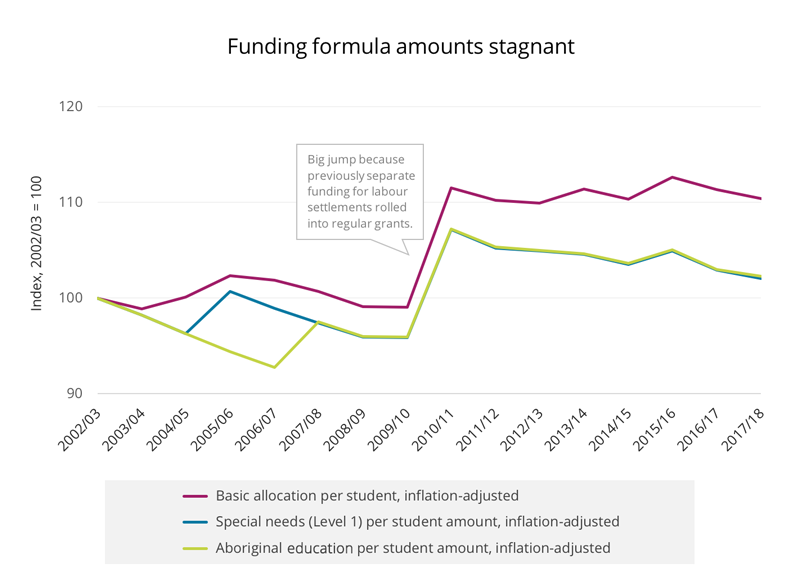 The chart below shows per-student amounts either barely keeping up or, in the case of special needs and Aboriginal education student supplements, even falling behind inflation since the introduction of the formula. In fact, the year-to-year change in the per-student funding amounts appears to be haphazard—sometimes with no increase for several years, which represents a cut in real terms. The lack of a transparent process to tie annual funding allocations back to inflation or other cost factors is a significant problem with the current funding formula. Source: British Columbia Ministry of Education, Operating Grants Manuals by year. To make up for inevitable shortfalls, the province has forced belt-tightening onto districts. Stories like this recent one from North Vancouver, where school trustees are debating whether to cut counsellor and other specialist teacher positions or to cancel computer purchases and new science lab technicians, are all too common. Cash-strapped districts have also been encouraged to start businesses to raise funds (which takes away from their core mission), to increase international student enrolment, or to lean more heavily on parents. And when the pressures have become too much, the province has supplemented formula funding with last-minute temporary grants. This is how we got an alphabet soup of funds: LIF (Learning Improvement Fund), CEF (Classroom Enhancement Fund), REE (Rural Education Enhancement), etc. Each of these is, however, insufficient—a weak patch covering severe structural gaps. 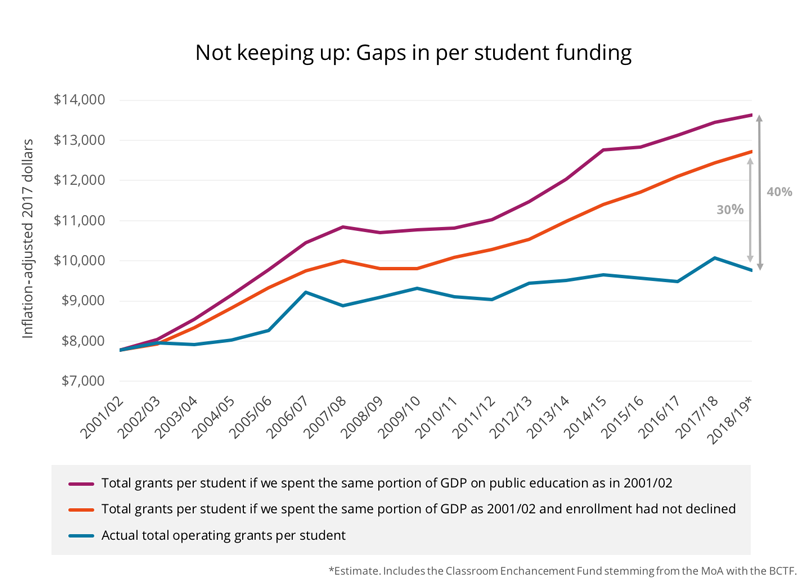 Overreliance on per-student funding may have been an ideological move by the previous BC Liberal government, which in 2002 completely revamped the prior formula—one that while not perfect, had more closely matched resources to school needs and actual costs. The pre-2002 formula distributed some funds on a per-student basis, but it also recognized fixed costs and particular needs, including things like per-school amounts for administration, separate funding for utilities and separate amounts for learning resources based on the number of schools and students in a district. Almost-exclusive per-student funding, on the other hand, mimics what happens under a voucher or “school choice” system—overemphasizing a fictional, abstract “equality” above the concrete, varied circumstances facing students across the province. So many of the issues facing our province’s public K–12 education system come down to funding: classrooms that lack resources and materials, short-changed student transportation, not enough specialist teachers for students with special needs. To solve these problems, it’s time to go back to basics. Funding must first of all be adequate. Deciding what level of funding is adequate is a task that cannot be outsourced to bureaucrats. It is a political choice that governments have to make about how to spend our collective resources. Remember that there is no magic that a formula can do with a too-small total pool of funds. In addition, governments must ensure that education funding is shared equitably, distributed so that every school district, every school, every classroom and every child receives what is necessary to meet their particular needs. The best way to ensure adequate funding for education is to tie funding to the actual costs and resource needs of running schools and districts and to move away from the excessive cost control enforced by the current formula. Any new funding model should be explicit about broad categories of readily identified needs and the cost of the resources required to fulfill them. If the Province enacts curriculum change, it must fund its genuine cost. If it signs a collective agreement, it must fully fund that as well. If we want students with special needs to thrive and be truly included, the specialists that can help them succeed must be funded. Inclusion is not complete when some students are identified as having a “high incidence” need, but no funds are dedicated to help accommodate them. Similarly, while BC schools have begun the difficult work of reconciliation, fully supporting Indigenous learners and meaningfully infusing Indigenous content and perspectives for all students requires resources to match measurable demands for materials, professional development and staffing—all currently not fully met. Funding distributed almost exclusively on a per-student basis obscures the true costs of a well-functioning public education system. Once a need is identified, it must be met with resources. How much does it cost to maintain classrooms? To provide supplies, up-to-date textbooks and technology? To revamp the curriculum? Determining needs and how they are to be adequately addressed is not easy, but that does not mean that it is impossible. Imagine a well-resourced, flourishing school—this should be our reference point a provincial funding model. Understanding what a school needs to thrive makes chronic underfunding harder to sustain and makes it easier to fulfill all the other values education funding should uphold: equity, stability, transparency, flexibility. Indeed, stakeholders from around the education system could engage in a collaborative, transparent process every few years to ensure that funding is both stable and responsive to needs. This would introduce real accountability from below in recognition of the fact that funding education is not purely a administrative exercise. In the meantime, total operating funding for public education should grow at least in line with inflation from year to year, supplemented by increases stemming from contractual obligations or fixed cost pressures. There are many balances to be struck: between school district autonomy and province-wide priorities or between rural and urban districts, to take just two examples. The current formula fails at this balancing act in multiple ways, largely because funding is kept inordinately scarce. The good news is that the new provincial government is currently reviewing the funding formula. A new, needs-based funding model linked to a guarantee of system-wide funding adequacy would start to make up for many lost years of chronic underfunding. The coming months are an opportunity to speak up for education funding that gives schools the resources to do what they are meant to do: educate students, level inequities and support communities. We have an opportunity to truly allow BC students and schools to thrive and for education to fulfill its vital mission.